Natural fibre composites are plastics reinforced with natural fibres: mostly wood, bamboo, flax or hemp. They are increasingly used in consumer goods like watchcases, toys, combs and trays. The unique look and feel of these composites give the impression of a high-value product. German nova-Institute devoted a conference to them this month, the sixth in a row already. ‘New major suppliers such as PolyOne and demand from the market can be expected to boost future growth,’ says Michael Carus, manager director of nova-Institute. ONORA biobased coffin with hemp fibre reinforcement. For many years, research institutes and industrial labs have been developing wood-plastic composites (WPC) and natural fibre composites (NFC). Industries use the materials in small series of consumer goods. The end products have a more refined look than pure plastic products, they stand out, look more natural, have a nice feel and need less plastic due to the wood and natural fibres – which benefits the environmental footprint. Mechanical properties are as good as those of their competitors. But most importantly, the products appeal to consumers. So far, the only market with considerable volumes is the decking and flooring market. But now, natural fibre composites have been developed well enough to enter into other major markets, like the automotive industry. At the ‘Sixth WPC & NFC Conference’ in Cologne, leading companies presented their WPC and NFC granulates as well as their application in consumer goods and automotive industries. The conference followed the latest edition of nova-Institute’s market study ‘Wood-Plastic Composites (WPC) and Natural Fibre Composites (NFC): European and Global Markets 2012 and Future Trends in Automotive and Construction’. The most commonly used plastics are PP, PE and PVC, but also biobased materials are used, such as bio PE and PLA. Plantoys reinforced with rubber tree fibres. At the conference, the coveted ‘Wood and Natural Fibre Composites Award’ was granted by the participants to the Dutch company ONORA for its 100% biobased coffin with hemp fibre reinforcement in injection moulding technology. This technology allows for great freedom of design and a variety of shapes and colours. 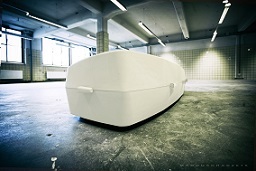 The coffin is biodegradable and has a very low CO2 footprint. The second place was for the Dutch company Millvision for its flower pots made of biodegradable biocomposite with agro rest fibres. They are used for tree nurseries and market-gardens and are cold soil biodegradable within just a few months. In addition to that, the pot acts as a fertiliser. The third place was for the Finnish Aqvacomp Oy and Flaxwood Oy for their cellulose fibre-reinforced polystyrene for music instruments. These composites have the potential to replace the use of some rare and threatened wood species. The companies developed a number of recipes for various musical instruments, for example a cellulose fibre composite replacing granadilla wood in clarinets. The components have excellent thermal and humidity resistance, reducing the typical tuning problems of wooden instruments. New natural fibre composites products come to the market every month. Last month for instance, the German company Tchibo introduced a WPC bedside table clock. Two weeks later, the Thai company Plantoys introduced a series of toys with wood particles from old rubber trees as a filler. The surfaces of the toys have a pleasant rubber-like feel, quite different from traditional plastics. Bamboo fibres too, are increasingly used in consumer goods, such as in trays from the Chinese company Yong used in organic restaurants. And the German drugstore chain dm has been selling a comb made of WPC for about three years and recently added a second model. Here you can find all information about the winners and other nominated candidates, the innovation award and the conference. All proceedings of the conference will be available soon here.